Queen City Cinephiles Film Festival will screen Last Disintegrated School in Charlotte North Carolina on Friday February 15, 2019, at Thirsty Nomad Brewing, 4402 Stuart Andrew Blvd A, Charlotte NC. at 7:00 p.m. There will be a Q & A via Skype with filmmaker, Alice Crowe. 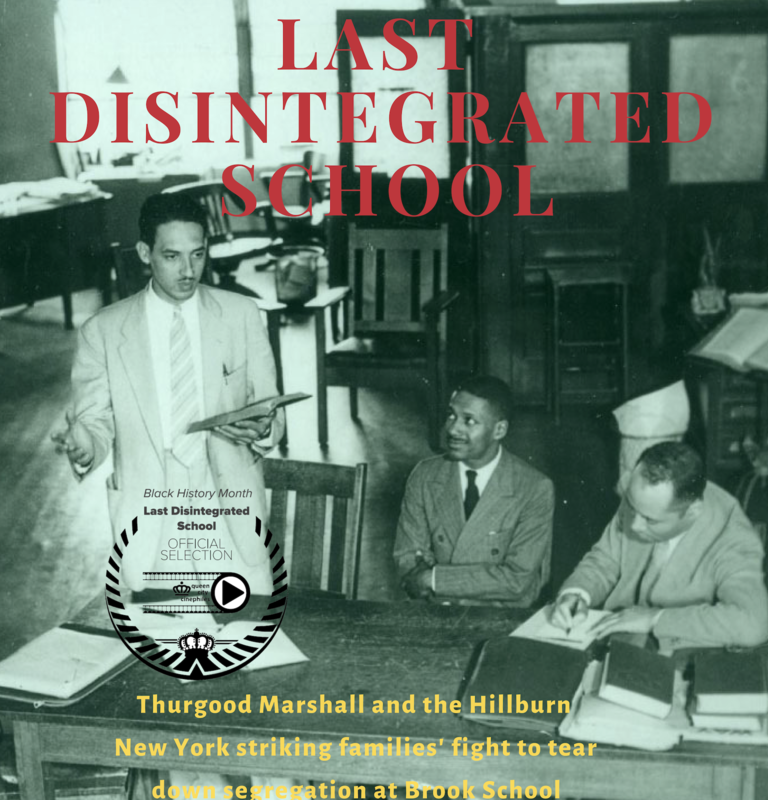 Last Disintegrated School tells the untold story of the day Thurgood Marshall came to a segregated mountain community called Hillburn in upstate New York. Marshall, an NAACP lawyer at the time, assisted Hillburn’s striking parents in breaking down racial segregation at Brook School, the last school to be integrated in New York in 1943. Black parents engaged in a strike of the school system and withheld their children from attending the segregated Brook School. Last Disintegrated School is written by Alice Crowe and directed by Alicia Crowe, identical twins, first time filmmakers, and attorneys. The film is narrated by Chuck D, rapper, author, producer, and Rock & Roll Hall of Fame music artist. Music is composed by Sam Waymon, award winning music composer and brother of music icon Nina Simone. “We are particularly excited about Last Disintegrated School being screened in North Carolina. We feel a particularly close connection with North Carolina. In 1920 our grand parents were public school teachers in Clayton, a town in Johnston County, North Carolina. Our grandmother Edith Cleopatra Crowe was a mathematics teacher. Our grandfather Julius Crowe was principal of White Oak School, a Rosenwald school in Newton Grove, NC in Sampson County.” Julius Crowe was a graduate of Brick College in early 1900’s. Brick College was a traditional and trade school for African American students founded by the American Missionary Association near Enfield, Edgecombe County, North Carolina. The Crowe Sisters have been advocates and educators for nearly two decades. When they learned that Justice Thurgood Marshall was the lawyer who advised Hillburn striking parent’s they knew this was a story they had to tell. Their passion for telling this story stems from the fact that like Mr. Marshall, they too are graduates of Howard University School of Law, and trained under the philosophy of Charles Hamilton Houston, Dean of Howard University Law School, and NAACP first special counsel . Hamilton is known as “The Man Who Killed Jim Crow.” His legal strategies played a key role in almost every civil rights case that went before the Supreme Court between 1930 and 1954, Brown v. Board of Education . The Crowe Sisters share a common bond of advocating for justice and equality. Last Disintegrated School is co-produced by the Crowe sister’s production company A Crowe Flyz Productions in association with Turnstone Productions. Last Disintegrated School was made possible with funding from the Arts Council of Rockland, The Rockland County Legislature, the Rockland County Women’s Bar Association, the Julius and Eleanor Kass Family Foundation, and the Puffin Foundation.